The April 2017 issue of the Swedish-American Historical Quarterly has published a chapter from my recent book, Scandinavians in the State House: How Nordic Immigrants Shaped Minnesota Politics. The chapter, “Radicals in exile,” is about some of the thousands of radical and blacklisted Swedes, who left their home country and settled in Minnesota, where they continued their political and union activities as members of the Industrial Workers of the World (IWW) and the socialist and communist parties of America, seeking to improve the lives of working men and women in their new home country. It’s not a widely known story of the Swedish immigration to the United States, but it is an important part of how these Swedes and other Scandinavians became involved in and shaped U.S. and, particularly, Minnesota politics. “My grandfather never mellowed. He used to say to me, ‘to be radical is to get to the bottom of things.’ ” Brad Engdahl, a successful lawyer in Minneapolis, remembers with fondness his grandfather Walfrid Engdahl, who was twenty years old when he arrived in Minnesota in 1910 after being blacklisted and forced to leave Sweden following the General Strike of 1909. Born in Ellenö in western Sweden’s Dalsland province not far from the Norwegian border on March 5, 1890, Walfrid Engdahl was almost ninety when he died in Minneapolis on January 29, 1979. Engdahl was among the Scandinavian immigrants who came to America in the second big migration wave after the turn of the twentieth century. They often came alone, looking for work and settling in America’s cities. Many of them, like Engdahl, had been active in the battles for political and union rights in their home countries and were forced to emigrate for political reasons. They were, in a sense, radicals in exile in America, in a country that, it would turn out, had little appetite for their brand of politics. Like so many other immigrants, Engdahl made his way in the new country by doing odd jobs, working the railroads all over the West and Canada and eventually becoming a carpenter. He was for almost sixty years active in the labor movement, both as an organizer and a writer. He joined mainstream politics in Minnesota and held several positions in the state government before retiring in 1955. He became a leading voice in Swedish American organizations and a prominent pen in the Swedish American press. He left a mark. These radicals in exile, these political firebrands, came from all over Scandinavia. Their newspapers tell their stories: Norwegian Gaa Paa (Forward) in Minneapolis; Finnish Työmies (the Worker), Sosialisti, and Industrialisti on Minnesota’s Iron Range; and Swedish Forskaren (the Investigator) and Allarm in Minneapolis. There were also radical papers in English: New Times came out in Minneapolis between 1910 and 1918 and was closely allied with the Minnesota Socialist Party and socialist mayor Thomas Van Lear, and Truth, started by Scandinavian socialists and published in Duluth between 1917 and 1923, was militantly socialist and a strong supporter of the Industrial Workers of the World (IWW). Two Harbors Socialist, published in the small North Shore town, was run for years by Swedish and Norwegian socialists. The records of these radical Scandinavian immigrants are often limited. Some died unknown in the new country; some returned or were deported to Scandinavia, where they often continued their political and union activities. Some remained radical all their lives, while others joined the political mainstream and ran for political office as members of the Farmer-Labor Party or its successor, the Democratic-Farmer-Labor Party (DFL). Walfrid Engdahl’s story is well documented and gives a good picture of the life of one of Minnesota’s many radical Swedish immigrants through his unpublished and unfinished memoir, “My Life,” and through lengthy interviews in English and Swedish for two oral history projects. Walfrid Engdahl’s father was a skilled carpenter and cabinetmaker and also cultivated a small piece of land. His mother, a midwife, was an avid reader of religious books but could not write. Walfrid had five siblings, including his twin sister, Ellen, who, he writes in his memoir, was the perfect playmate. She died just four months before he finally made it back to Sweden in 1966 for the first visit since leaving for America fifty-six years earlier. “That is something I regret, very, very much,” he adds. At fifteen, Engdahl moved to Stockholm, where he became a member of Stockholms Norra, a social democratic youth club founded in 1892. By 1902, it had 130 members, many of whom would later find their way to America, where they continued their political and union activism. That same year, these young socialists participated vigorously in the big political strike for the right to vote, which Swedish men did not achieve until 1909 and Swedish women not until 1921. Politics was often discussed at work. Henrik “Hinke” Bergegren and Hjalmar Branting were the two leading social democrats of the time. Branting’s speeches were “genuine” road maps for how the “working class would win its socialist society,” writes Engdahl. Meanwhile, Bergegren “wanted revolution in a bold, open way,” arguing that politics could never establish a socialist society and that only a general strike could destroy the capitalist system. He favored a more revolutionary approach over the parliamentary strategy pursued by Branting, who later became Sweden’s first Social Democratic prime minister. In 1908, Bergegren was expelled at the party congress. Engdahl left Sweden for America just as he turned twenty, arriving at Ellis Island in New York on April 1, 1910, one of thousands of blacklisted Swedish workers forced into exile during this period. Accord- ing to official statistics, Swedish emigration jumped to almost 22,000 people in 1909 from 12,499 the previous year. The numbers were particularly high during the last months of 1909, after the General Strike. In December that year, the number of people leaving Sweden was three times as high as in December 1907. In 1910, the numbers climbed even higher, reaching almost 28,000. During the General Strike, a total of eight hundred young socialists were criminally charged and five hundred were handed sentences ranging from fines to prison terms for giving speeches, insulting the monarchy, or trying to organize. Workers were persecuted at their jobs; many were fired and evicted from their homes. An estimated twenty thousand Swedish workers left for North America because the employers’ blacklists made it impossible to find work. Once in America, many of these men continued to be active in politics and in the unions. They often joined organizations and clubs most similar to the ones they had left behind. The social democrats went to the Scandinavian Socialist Labor Federa- tion, part of the Socialist Party, and to the identically named Scandina- vian Socialist Labor Federation, a wing of the Socialist Labor Party. The young socialists and the syndicalists formed a Scandinavian section of the syndicalist/anarchist Industrial Workers of the World in the United States. The anarchists also gathered around a Chicago monthly called Revolt. Many joined temperance groups, such as Verdandi. Temperance was an important part of their identity, as it was for Engdahl—a lifelong temperance man. Engdahl, once in Minneapolis, wasted no time in rejoining the labor movement. He was equipped with the addresses of the American Federation of Labor Carpenters Union Local 7, founded in 1892 by a group of Swedish socialists, and the local branch of the IWW. He knew no English, but the secretary of the union was a Swede, and with his help, Engdahl started working immediately. His first job was to help build the first hospital unit at the University of Minnesota. Work took him to the Dakotas, Montana, Washington State, and British Columbia. A new job at the Swedish-language paper Forskaren (the Investigator) was the reason for Engdahl’s return to Minnesota. It launched his career as a journalist and writer. The paper was founded by two Swedes as “an organ of socialism and free thought.” Forskaren, called by the British scholar Michael Brook “a Swedish radical voice in Minneapolis,” was not the first radical Swedish newspaper in Minnesota, starting already in 1876 with Agathokraten (One Who Believes in the Rule of the Good), according to Brook, and Rothuggaren (the Radical) in 1880. In 1891, Gnistan (the Spark), subtitled “A Swedish Radical Weekly,” was founded by the Reverend Axel Lundeberg, who had worked in Sweden with August Palm, the father of Swedish socialism, before Lundeberg came to Minnesota. Gnistan closed in 1892. Forskaren lasted much longer, first as a newspaper and then, for nineteen years, as a periodical. It was closely associated with Frihetsförbundet (the Scandinavian Liberty League), founded in Minneapolis by radical Swedes. It held Sunday school for the children of the members of temperance groups such as International Order of Good Templars and Verdandi together with the First Scandinavian Unitarian Church in Minneapolis, started by David Holmgren, an ordained minister who, facing imprisonment for financial irregularities, fled to America in 1906. Engdahl became a Wobbly—a member of the Industrial Workers of the World—shortly after arriving in Minneapolis. IWW was a union founded in Chicago in 1905 by Eugene Debs, “Big Bill” Haywood, and a couple of hundred other delegates, among them some Swedish immi- grants. The Wobblies urged direct action through strikes and other means, and they scorned the political process. Their rallying cry was “One Big Union.” At the time, Minneapolis was said to have one of the biggest local IWW organizations in America. One of Engdahl’s first articles was about IWW activist and fellow Swede Joe Hill, whose songbook, To Fan the Flames of Discontent, the IWW published in 1916. Born Joel Emmanuel Hägglund in Gävle, Sweden, in 1879 and also known as Josef Hillström, Hill left for America in 1902 and became a migrant worker out west, eventually joining the IWW. He was sentenced to death and shot by a firing squad on November 19, 1915, in Salt Lake City, Utah, for a murder and robbery he most likely did not commit. Engdahl wrote for Allarm until its last issue in May 1918. He believed being a revolutionary was the “self-evident duty of the awakened worker,” and it is “preferable to die as an honest revolutionary rather than to defend the mortal enemies on Wall Street. It is more honest to die for freedom than for the private capitalists. We are the defenders of freedom and nothing can suppress us.” Is there anything “more rotten than politics,” he asks in another article and calls the approaching World War I the “greatest curse.” It was better to die in an “honest revolution than on the bloody and stinking battlefields.” Engdahl believed that the IWW was the only group that dared to take action. On September 5, 1917, agents of the US Department of Justice raided forty-eight IWW halls across the country and arrested 166 Wobblies on charges of violating the US Espionage Act. In the final six months of Allarm’s existence, much space was devoted to these arrests and the subsequent trial in Chicago. Among the arrested were three Swedes: the editor of Allarm, Carl Ahlteen; its business manager, Sigfrid Stenberg; and Chicago-based Ragnar Johanson, a painter, IWW activist, and frequent contributor to the paper. A fourth Swede, Edward Mattson, managed to avoid arrest by fleeing to Canada. Returning to Sweden, he became a leading figure in the syndicalist movement. At the trial, Ahlteen was sentenced to twenty years in prison and fined $20,000, while Stenberg and Johanson each received ten-year prison sentences and fines of $30,000. They never served their full prison terms. In a deal with the US government, they were released in early 1923 and deported to Sweden. A photo in the Swedish syndicalist paper Arbetaren from January 24, 1923, shows three smiling young men in overcoats and elegant hats arriving by boat in Göteborg, welcomed by friends and colleagues. Carl Ahlteen, spelled Althén in Swedish, came to America from Grimslöv in Småland in southern Sweden soon after the General Strike. According to Michael Brook, Ahlteen prided himself on his hardness and realism, always insisting that the workers must fight for themselves. Power and power alone must be the motto of the working class, Ahlteen writes in Allarm in June 1916, and when the worker wakes up, the time has come when “our comrades once again can breathe freely.” Back in Sweden, Ahlteen’s political and union activities faded, and it is possible that Ahlteen again left Sweden in the 1930s and that he died in Colombia soon after World War II. Ragnar Johanson was a prominent syndicalist before leaving for America in 1912. Called “a silver tongued orator,” he frequently wrote for Allarm and became a leading itinerant agitator for IWW among Swedish immigrants in America. Once back in Sweden he continued his syndicalist activities and was for many years a manager at the syndicalist publishing house Federativ. He died in 1959. Sigfrid Stenberg, born in Stora Tuna in the province of Dalarna in 1892, worked in the lumber industry and as a painter before coming to America in 1912. He was Allarm’s business manager until his arrest in 1917. The evidence on which Stenberg’s conviction was based was a telegram he wrote that said in Swedish, “Sänd Allarm”—meaning “Send Allarm,” the paper—which the prosecutor translated as “Send all weapons.” Stenberg also continued his union activities in Sweden. He joined SAC, the Swedish syndicalist organization, and worked as a journalist at SAC’s newspaper Arbetaren until his death in 1942, at the age of fifty. After Allarm ceased publishing, Engdahl started writing for other newspapers and periodicals, often about culture, literature, music, and poetry. He wrote for Henry Bengston’s Svenska Socialisten (the Swedish Socialist) in Chicago, the organ of the Scandinavian Socialist Federation, founded in 1910 in Chicago and which had at its height over thirty-seven hundred members, mostly Swedes. He wrote for Bokstugan (the Book Cabin), a literary magazine and official organ of the Verdandi Study League, also in Chicago, started in 1919 by Wallentin Wald, a young painter from Engdahl’s Young Socialists Club in Stockholm who had left for America after serving a prison sentence for distributing pacifist leaflets in Stockholm. At Bokstugan, Wald surrounded himself with a group of enthusiastic literary contributors, among them Engdahl. They were not academically trained, but they were all “serious thinkers and well able to express themselves in both verse and prose.” Bengston said Bokstugan, which published articles in both Swedish and English, “reached a, by far, higher literary standard than any of its Swedish contemporaries in the United States.” September 1928 was its last issue. Wald died in 1946. Later, between 1958 and 1969, Engdahl was a frequent contributor to Kulturarvet (Swedish Heritage), also edited by Bengston and published by the Swedish Cultural Society of America, which elected Engdahl its chairman in 1964. Engdahl also wrote a regular column for the Minne- apolis Labor Review and showed great fondness for early progressive Swedish American politicians in Minnesota, such as Magnus Johnson and Charles A. Lindbergh Sr. In the early 1930s, Engdahl joined the Farmer-Labor Party and held several positions in Governor Floyd B. Olson’s administrations. Until the mid-1950s, Engdahl was in charge of the construction and mainte- nance of the public welfare buildings in Minneapolis. Governor Olson also named him the first union representative of organized labor on the building commission for a new office building. When Engdahl was unable to prevent the commission from setting the pay scale 20 percent below union wages, he went to Olson ready to hand in his resignation. But the governor refused to accept it, and at a meeting to decide on the wages, Olson, according to Engdahl’s account in “My Life,” gave “one of the most factual and forceful speeches I have ever heard. When he was through, the chairman stated, ‘Gentlemen, you have just heard one of the greatest speeches by the greatest governor in the USA supporting the proposition of establishing the union scale as the prevailing scale on our office building. It is up to you to decide what to do.’” The motion to pay union scale carried. Carl Skoglund and Walter Malte Frank were contemporaries of Walfrid Engdahl in Minnesota. Both, also blacklisted, left Sweden for America as young men in their twenties in the immediate aftermath of the 1909 General Strike. And both left their mark on radical politics and labor relations in their new home country—Skoglund as a militant strike leader and a revolutionary communist until the end of his life, and Frank as a prominent union leader and a man of the political establishment in Minnesota who helped launch the Farmer-Labor Party of Minnesota and ran for political office—a “typical centrist,” as Skoglund once called Frank. For Skoglund and Frank, as for Engdahl, America did not seem to be “the thought for the day and the dream of the night,” as Isidor Kjellberg had written after the Sundsvall strike in 1879. They were not struck by “America fever.” Skoglund said in a 1960 interview for Minnesota’s Radicalism Project, “I had not thought about leaving Sweden, or emigrating. I had intended to stay, but because of this situation I had very little choice.” And Frank, who refused to serve in the Swedish army, later explained that his three choices were army, jail, or emigration, and he chose emigration. Skoglund, born in 1884, hailed, like Engdahl, from the province of Dalsland in western Sweden, more precisely from Svärdlungskogen, near the town of Bengtsfors. Growing up in Sweden, Skoglund described a hard life of strife and great poverty, where “conditions were very primitive.” His father was a “semi-feudal serf.” “In reality, my generation became the break between the old semi-feudal life and the new industrial life,” Skoglund said. Skoglund barely had three full school years behind him when he went to work at a paper mill. At twenty-one, he was drafted into the Swedish army like all other young men at the time. After the army, he went back to school for six months and also went back to work at the paper mill, but as he became involved in organizing the workers, he quit, or was forced to quit, and found that there were no jobs anywhere for him. He left for America, arriving in Boston in 1911 and continuing directly by train to Minneapolis, where a series of different jobs fol- lowed—cement mixer, lumberjack, night fireman, and janitor. These were hard years. “At the time, I had carried in my mind to commit suicide and to sit on the Minnesota River to jump in and drown myself,” he said. Skoglund helped Engdahl edit Allarm, and by that time he had started working for the Pullman Company’s railroad. He also started to write a column called “Kvarnstad Krönika” (Mill City Chronicle) for Svenska Socialisten in Chicago. At Pullman, he helped organize the Pullman workers into a new union, the Brotherhood of Railroad Car Men, affiliated with the American Federation of Labor (AFL). A nine-month- long strike in 1922 cost him his job, and Skoglund never worked for Pullman again. Following the outbreak of World War II, Skoglund and eighteen other Trotskyists were arrested under the Alien Registration Act of 1940, also known as the Smith Act. They were sentenced to jail and Skoglund spent 1944–45 in a federal prison. The Smith Act had made it a crime to advocate the overthrow of the US government and also stipulated that all non–US citizens had to register with the government. Carl Skoglund, or “Skogie” as his friends and fellow workers called him, is best remembered for his central role in the 1934 Minneapolis Teamsters’ Strike, a “landmark in the labor history not only of Minnesota but of the United States.” The strike, which took place at the height of the Depression, when one-third of the workers in Minneapolis were unemployed, was led by Skoglund and Vincent Raymond Dunne. They had met in the Minneapolis coal yards and came to play “critical roles in the struggle for union recognition in Minneapolis.” Dunne was of Irish and French-Canadian descent, born in Kansas City in 1889, but he grew up on a farm in central Minnesota. He became a lumberjack and a Wobbly and a socialist in his youth. In 1920 he joined the Communist Party and later became a Trotskyist, which he remained until his death in 1970. Skoglund and Dunne had joined Local 574 of the Teamsters Union, and later Dunne’s two brothers, Grant and Miles, also joined. Together, the four were “in competence, resourcefulness, and devotion to the labor movement without peers.” In organizing Local 574, Skoglund and Dunne tried something new. Instead of organizing around occupational special- ties, as was the tradition in the American labor movement at the time, they gathered all the workers together in a new industrial model, which, eventually, became the foundation of the CIO, the Congress of Industrial Organizations. Skoglund and Dunne “perfected a new motorized form of pickets as flying squads, roving the streets in their own trucks and cars, preventing strike breakers from making their deliveries.” They demon- strated an effective mastery of 1930s communication technology, used their telephones effectively, and published a daily strike bulletin. Local mass rallies mobilized support for the strike. “We’ll never let him send him back, Or start him on his way. Join the fight With all your might, Away with darkness, welcome light. Carl Skoglund’s here to stay. Frank was, like Skoglund, involved with organized labor in Scandi- navia before coming to America in 1913, with the Swedish sailors’ union and in the machine and metal union in Oslo. Unlike Skoglund, he was raised in a fairly well-to-do family but disagreed with their philosophy of life and struck out on his own. Once in Minnesota, Frank studied engineering at the University of Minnesota. He joined the IWW and went to work out west in harvest and lumber camps. During this time he met Joe Hill—“no doubt about that, he was framed,” Frank said in an interview for the Minnesota Historical Society. Frank’s later union activities involved the Lathers Union and the Building and Construction Trades Council. In a speech in Stillwater, Minnesota, on Labor Day in 1926, he urged his audience to join in the fight for a powerful, militant industrial union within the trade-union movement to build a true class-oriented Farmer-Labor Party. In 1932, he was appointed National Chairman of the AFL Trade Union Committee for Unemployment Insurance and Relief. He was active in the Farmer-Labor Party and ran for the state senate in 1930, but lost. In 1948, he ran for the US Congress as a candidate for the Democratic-Farmer-Labor (DFL) Party, but lost again. Like Skoglund, Walter Frank also encountered problems with the American immigration authorities, although he was a US citizen. In 1951, as he planned a trip to Europe that included a visit to his relatives in Sweden, he was denied a passport. The trip was deemed not to be “in the best interest of the United States,” according to the US State Department. It took Frank more than four years to get his passport and only after interventions from, among others, Hubert Humphrey, then US senator from Minnesota, and after swearing that he had never been a member of the Communist Party. A letter from President Dwight D. Eisenhower on September 24, 1956, starting with the salutation “Dear Fellow Citizen,” signaled the end of Frank’s long fight to obtain a passport. From the late 1880s to the mid-1950s, a remarkable stretch of time, the Scandinavian Left provided leadership to the labor movement in Duluth. Richard Hudelson—labor historian, former philosophy professor at the University of Wisconsin–Superior, and a Duluth resident—points to the sheer number of Scandinavians in Duluth. By 1870 a third of the city’s population was Swedish, along with 13 percent Norwegians and three percent Danes. The Finns came later. By 1920, 75,000 out of a population of 99,000 were foreign-born or children of foreign-born, and the Swedish population in Duluth was one of the largest concentrations of Swedish immigrants in the urban Midwest, proportionally larger than even Chicago and Minneapolis. And they became politically involved early. The members of the Duluth Scandinavian Socialist Local “brought a radicalism” with them from Sweden, and “there is strong evidence for the importance of the connection with Ljusne [labor conflict] in the history of the local” in Duluth. In 1917, the radical Swedes in Duluth started a paper called Truth. It was an English-language paper, and not Swedish, clearly showing that the Swedes, who were the largest foreign-born group in the city, felt confident enough to reach out to other ethnic groups. Affiliated with the Scandinavian Socialist Federation in Chicago and the American Socialist Party (SP), Duluth’s Scandinavian Socialist Local was one of the strongest in Minnesota. Its membership was almost entirely Swedish and largely blue collar. Socially, the members were close, spending free time together and holding Sunday picnics. Many members also belonged to the IWW, which had first established itself in Duluth in 1911. As the official organ of the Socialist Party of Duluth, Truth saw its circulation quickly rise to twenty thousand copies. The Duluth Scandi- navian Socialist Local’s members, of which there were more than four hundred, provided the leadership behind their newspaper, “the rock upon which Truth was built.” The paper eventually moved left and took its place on the side of revolution, which meant open support of the IWW as well as of the Russian Revolution. President Warren Harding ordered Bentall’s release in July 1923. The thousands of radical Scandinavians, mostly Swedes but also Norwegians and Danes, were often reluctant immigrants, forced into exile to find jobs, to survive. They left their home countries at a time of profound change, when a budding working class started its struggle for political and union rights. They lost that struggle, and they left for America. Many of them, blacklisted for their political and union activities, continued to be activists in their new home country. Engdahl, Skoglund, and Frank belong to this group. The impact of these radical immigrants on Minnesota and state politics was never great. They often moved in narrow circles, among ideological and personal friends, socializing with one another and reading their own newspapers. The exception—and it is a big one—was the Minneapolis Teamsters’ Strike of 1934, with Carl Skoglund as one of its leaders. The strike became a landmark in US labor history as the rights of the union were recognized and Minneapolis ceased to be an open-shop city. Skoglund kept his communist faith all his life and remained a political outsider, while Engdahl and Frank mellowed politically with time, joining mainstream Minnesota politics as active members of the Farmer-Labor Party. Here’s an interview with me in connection with my new book in today’s MinnPost, a leading Minnesota news site. “For Bergman – American immigrant, political junkie, Swede – the journey was a heady mix of history and heritage,” writes Gregg Aamot. Check it out, especially, as the sub headline says, if you have Nordic heritage although the value of the book goes beyond that. Hundreds came out for my Minnesota book events — thank you! I am happy to announce that several hundreds came out for my three book events last week in Minnesota, organized by my publisher, the Minnesota Historical Society Press, and that they produced such great discussions on immigration and politics, both on this side and the other side of the Atlantic. First at the American Swedish Institute (ASI) in Minneapolis, then at the University of Minnesota in Duluth (UMD), and, finally, in the Marine Village Hall above the library in Marine on St Croix, classic Swedish immigrant country. So there are many to thank: American Swedish Institute president Bruce Karstadt and discussion moderator, former state legislator Tom Berg; history professor Scott Laderman at UMD; and Phil Anderson, president of the Swedish American Historical Society, and Marine library’s Anne Reich, who jointly hosted the evening where so many of the town’s residents turned out for the discussion with Carleton College professor Steven Schier and Uppsala University professor Dag Blanck. Off to Minnesota on a book tour! I am off to Minnesota this week for three events to talk about my new book, Scandinavians in the State House — How Nordic Immigrants Shaped Minnesota Politics. Wednesday: American Swedish Institute/Minneapolis, 6:30 pm. Thursday: University of Minnesota/Duluth, 6 pm. Friday: Swedish American Historical Society Spring Meeting/Marine on St Croix, 7 pm.. Exciting! I look forward to seeing many old and new friends and to your comments and questions! Here is a Q & A about the book on the MNHS Press’ website. Here are some pre-publication comments about my book, “Scandinavians in the State House — How Nordic Immigrants Shaped Minnesota Politics,” which will be out on April 15. “They were farmers, miners, and laborers. They were Republicans and radicals. They were pastors, poets, and politicians. They were the men and women of Scandinavia who came to Minnesota in the nineteenth and twentieth centuries and gave their adopted homeland a distinctive, highly participatory civic culture. With rich detail, Klas Bergman tells a truly epic saga, inseparable from the story of Minnesota itself. 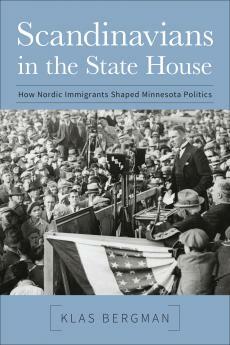 My book,”Scandinavians in the State House — How Nordic Immigrants Shaped Minnesota Politics,” will be out in April, published by the Minnesota Historical Society Press. Beginning in the 1850s, thousands of immigrants from Nordic countries settled in Minnesota and quickly established themselves in the political life of their new home. These Norwegians, Swedes, Danes, Finns, and Icelanders first sowed their political seeds at the local level—as town clerks, city councilmen, county commissioners, sheriffs—and then broadened their sights to the state and national realm. Nordic immigrants served as governors, as Minnesota state senators and representatives, as U.S. congressmen, and as vice presidents of the United States. Many came to this country for political reasons and became radicals and activists in Minnesota. Others served as key leaders within the state’s political parties. In Scandinavians in the State House, Klas Bergman explores who these immigrant politicians were and what drove them to become civically involved so soon after arriving in Minnesota. Profiling the individuals and movements at the forefront of this political activity, at the state and local level, Bergman examines the diverse political philosophies of the immigrant communities and reveals the lasting legacy of Scandinavian politicians in the creation of modern Minnesota—from Nelson and Olson, to Andersen and Carlson, to Humphrey and Mondale. Klas Bergman is a Swedish-American journalist and author. Born and raised in Stockholm, he is a graduate of Stanford University and has lived and worked in the United States for almost four decades. A veteran journalist and foreign correspondent, he has reported for both Swedish and American news organizations and has also held numerous positions in international/public affairs. Bergman is the author of two previous books — one, in Swedish, on the former Yugoslavia and Eastern Europe, and the second, in both Swedish and English, a personal and political retrospective on his years in the United States. Bergman lives with his wife in Silver Spring, Maryland. Follow him on Twitter @ksbergman.